Set up: Every player has a ball. Grid as large as needed for players to have ample space. 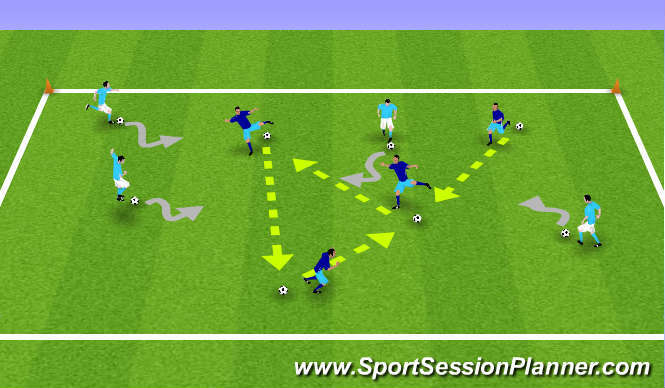 Session: On coach&apos;s command, all players dribble around the grid performing specific technical footwork (dribble cuts, base system, roll overs, etc). On next command, players will perform specific dynamic movement to the next open ball (high knees, lunges, quad flex, etc). Once at open ball, players then go back to technical footwork. Footwork: Dribble Cuts, Scissors, Step Overs, Cruyff Turn, V Pull Back, etc. Set Up: Grid is 10 yards wide by 15-20 yards long. Three lines of players with the Attacking line at the top of the grid, one Defending line (the Pressure) starting by the goal, and one Defending line 3-5 yards up the sideline depending upon ability. Activity: Depending on ability of players, coach can either play ball out, or "Pressure" defender can play ball out. 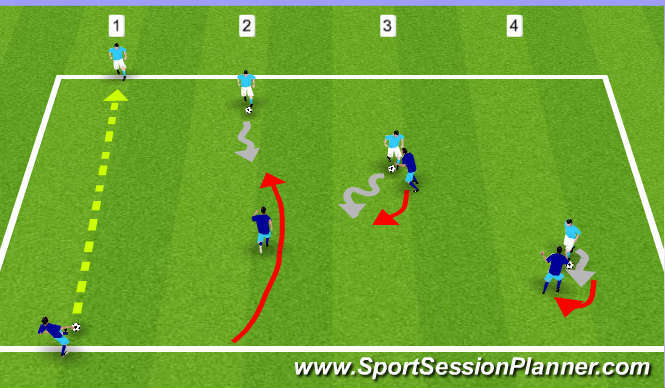 As ball is played out, "Pressure" defender sprints out to pressure defender with proper technique. 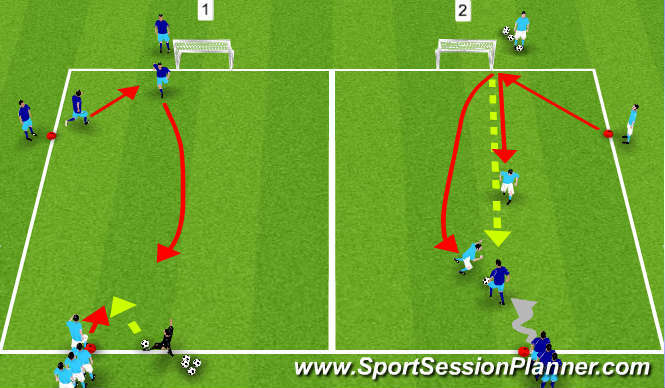 "Cover" defender must sprint and touch goal before entering field. When "Cover" defender enters field, they must provide proper supporting angle to "Pressure" defender as shown in (2). Add another goal to increase decision making and pressure on defense. Coaching Points: Proper defending technique from first defender, proper angle of support from second defender, if "Pressure" defender gets beat then "Cover" defender must step up and become "Pressure" while first defender reCOVERS behind. Have "Pressure" defender push attacker to side where "Cover" is coming from. Add in communication techniques with advanced groups such as, "push left, push right, contain" etc. Set Up: 20-30x25 yards. Coach in the middle with all of the balls, and three lines on each team&apos;s side. Activity: Coach plays ball out to one side and both teams enter field. Defending team must send closest person to the ball to pressure, and other two players must find proper supporting angles to cover. Attackers try to score, and if defenders win ball, they attack opposite side. Add two more goals to make it more difficult. Coaching Points: Defending team must have closest person to ball pressure immediately, and other two defenders provide cover. If pressuring defender is beaten, then covering defender must quickly come up to pressure, and intial pressuring defender reCOVERS. Patience on defense, closing attacker off to either sideline or where help is depending on where they are on the field.